Only 6 day Hanoi holiday in Vietnam luxury travel style will mark the highlight of your life travel with luxury Halong bay tour - the King of all Vietnam tour packages, Tam Coc - the most charming countryside in Vietnam, thousand year Old captial of Vietnam. Hanoi is one top destination for all Vietnam tours. Our guide picks up you at the airport. Transfer to your hotel. Free at leisure. 8:30 Start your Hanoi package by visiting the Temple of Literature, Ho Chi Minh Mausoleum(close on Monday and Friday), his House on Stilts. Take a look at the unique architecture of the One Pillar Pagoda - one of top destinations for Vietnam tour packages. Afternoon, visit Tran Quoc pagoda, the oldest one in the middle of a beautiful lake. Then take a cycling tour around the French and busy old quarters. Enjoy waterpuppet show, the best of Hanoi tours. Now, you have had some experience why this Hanoi package is the best choice for Vietnam tours. 8:00 AM drive to Halong Bay. On arrival, enjoy Welcome drink and check in luxury Halong bay cruise. You will get surprised at the first sight of Halong Bay, The highlight of all Vietnam tour packages. First, cruise Halong Bay through many naturally shaped limestone islands which amazingly come up from emerald water. Unforgettable experience on the surprising cave, a great stop during Halong bay tour. Swimming or relaxing on your luxury Halong bay cruise to see the sunset( kayaking is optional). 18.30: Anchor for overnight. 19:30 Enjoy delicous Vietnamese dinner. 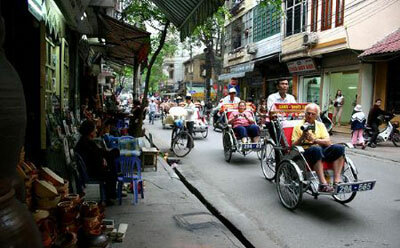 Now, you have had more experience on Hanoi package, a great choice for Vietnam holidays. Relax and see the sunrise over the bay. 8:00 Climbing 330 steps on the top for great photoes or swimming at Titop island. 9:00 Back to your boat. Freshen up and check out. 10:00 Enjoy buffet brunch while cruising through many limestone islands of different shapes. 11:00 Transfer by tender to the pier. Drive back to your hotel at 16:00. Some of the best days in your life have been created during Halong bay tour. Today, enjoy 2 hour driving through the countryside's stunning scenery to Tam Coc. Arrive at 10: 00, discover Tam Coc, the other highlight of Hanoi package, by joining a sampan rowed by the locals to explore stunning nature beauty. 12:30 Have lunch. Visit Bich Dong pagoda with three levels from the bottom to the top of the mountain. Drive back to your hotel about 17:00. You have discovered the most beautiful countryside for Vietnam holiday packages. Transfer to airport. Your Hanoi package ends. Join Hanoi package with most of the top destinations for Vietnam holiday. Commitment to excellent and satisfaction. Join luxury Hanoi package for great moment.